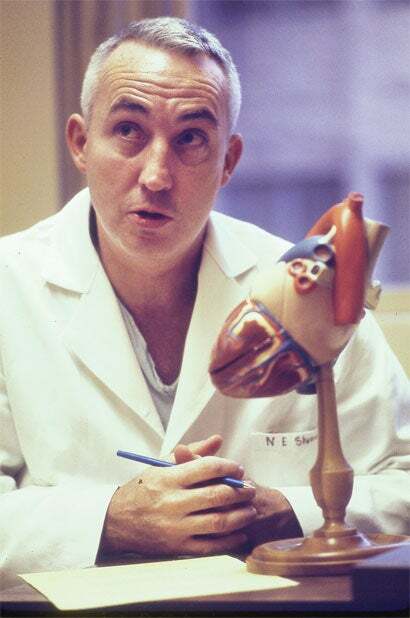 Norman Edward Shumway (February 9, 1923  February 10, 2006) was a pioneer of heart surgery at Stanford University . He was the 67th president of the American Association for Thoracic Surgery and the first to perform a successful Heart transplantation in the United States. Shumway was born in Kalamazoo, Michigan. He attended the University of Michigan for one year as an undergraduate law student until he was drafted by the Army in 1943, which sent him to John Tarleton Agricultural College in Stephenville, Texas for engineering training. He then underwent Army Specialized Training, which included nine months of pre-medical training at Baylor University, followed by enrollment at Vanderbilt University for medical school. He received his M.D. from Vanderbilt in 1949. He did his residency at the University of Minnesota under Walt Lillehei alongside future fellow transplantation pioneer Christiaan Barnard, and was awarded a surgical doctorate in 1956. In 1958, he began working as an instructor in surgery at Stanford Hospital in San Francisco, California, and later, in Palo Alto when the hospital was moved. He spent many years training promising young residents of cardiology and cardiothoracic surgery at Stanford University. Among his notable trainees is Stanford cardiologist Hannah Valantine, a native of Gambia who was appointed in 2014 as the U.S. National Institutes of Health Chief Officer for Scientific Workforce Diversity. In collaboration with Randall B. Griepp, he was the first doctor to successfully carry out a human heart transplant operation in the United States in 1968, after Barnard’s 1967 operation in South Africa, which was partly based upon the work of Demikhov, Shumway and Richard Lower. The early years of the procedure were difficult, with few patients surviving for long. Shumway was the only American surgeon to continue performing the operation after the poor survival outcomes of these early transplants. In the 1970s he and his team refined the operation, tackling the problems of rejection and the necessity for potentially dangerous drugs to suppress the immune system. In particular he pioneered the use of cyclosporine, instead of traditional drugs, which made the operation safer. Shumway was inspired by Nobel Prize winners, Dr. Joseph Murray and Sir Peter Medawar. The world’s first heart-lung transplant was performed in 1981, by both Shumway and Dr. Bruce Reitz. The René Leriche Prize, International society of surgery, 1971. The Texas Heart Institute Medal and the Ray C Fish Award for Scientific Achievement in Cardiovascular Diseases, 1972. Cameron Prize of the University of Edinburgh, 1976, for pioneering use of cyclosporine in heart transplant surgery. Gold Heart Award, American Heart Association, for contributions to Cardiovascular Medicine, 1982. Outstanding Achievement Award, University of Minnesota, 1985. Michael DeBakey Award, Michael E DeBakey International Surgical Society, 1986. The Rudolph Matas Award in Cardiovascular Surgery, Tulane University, 1986. In his later years Shumway was the first recipient of the Lifetime Achievement Award given by the International Society for Heart & Lung Transplantation. He also received the 1994 Lister Medal. Honorary degree, University of Pavia,1998. Shumway’s marriage to the former Mary Lou Stuurmans ended in divorce. The couple had four children, one of whom directs heart and lung transplantation at the University of Minnesota. Shumway died of lung cancer in Palo Alto in 2006, on the day after his 83rd birthday. He has been described as ‘humble’, ‘focused’ and shying away from publicity.